The Kirovets family of four-wheel drive, heavy duty tractors first and foremost includes the legendary K-700 model, a vehicle that was first manufactured by the Kirov machine-building manufacturing plant in St. Petersburg in 1962. Known internationally for its reliability and efficiency, the K-700 was the most powerful tractor in the Soviet Union; its productivity in agriculture was three times that of other tractors which existed at the time. A vast number of agricultural, logging, construction and auxiliary vehicles have been created on the Kirovets chassis since 1962; the Kirovets was in extremely high demand and more than 450,000 such tractors, with various modifications, have been assembled in the past forty years. — PatrecC^ (@patrecc) 13 декабря 2016 г. In an interview with Sputnik Mundo, Sergey Serebryakov, Director of the Peterburgsky Traktorny Zavod, a subsidiary of the Kirov Plant, gave kudos to the K-700 tractor. "This tractor has not only plowed the vast expanse of the Soviet Union, but it's also worked in the fields of America, Canada, Australia, Europe and Cuba. At least five K-700s operated as tractor trucks in Antarctic airfields," Serebryakov said. — MANUEL FILIPE (@MANUELFILIPE67) 11 ноября 2015 г. According to the website of Peterburgsky Traktorny Zavod, "the basic concept of the Kirovets tractors is high performance, excellent off-road performance and maneuverability, simple and reliable design, reparability, and building block design with the traditional, as well as modern wide-cut complex tillage and seeding machinery." All this was written of the K-744R, a fundamentally new vehicle which has gradually replaced the outgoing K-700 tractors in Russia and beyond. Right now, Peterburgsky Traktorny Zavod produces a total of 8 versions of the K-744R, as well as 18 kinds of industrial machines. "Over the past three years we have increased the production of [the Kirovets] tractors three-fold, manufacturing 2,460 such vehicles in 2016. Currently, the Kirov tractors already dominate 65 percent of the Russian market for high-power tractors," Serebryakov said. Peterburgsky Traktorny Zavod's website, in turn, cited the K-744R's "excellent towing and transport characteristics," which means that the Kirovets tractors can be used "year-round in the toughest hauling operations: cold weather operation, the towing of jammed vehicles etc." 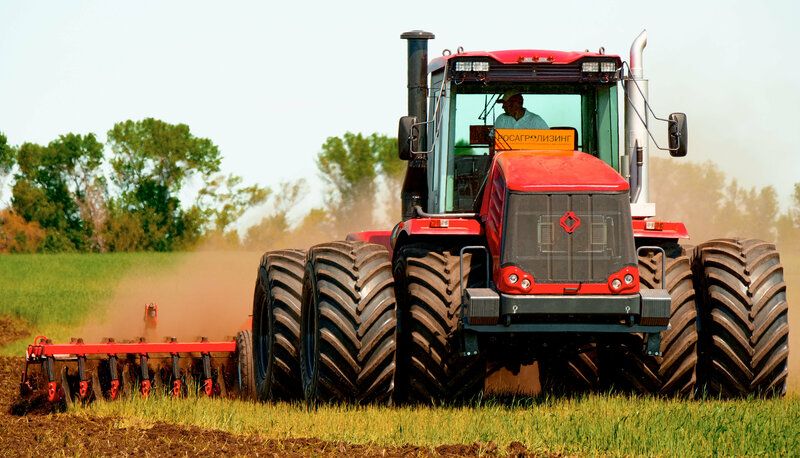 Notably, the tractor's cabin and control system are in line with strict international standards. Serebryakov, for his part, told Sputnik Mundo that they decided to compare the performance of the K-744R with that of an American tractor in field conditions. "Our efficiency proved to be higher by 13 percent and we spent 10 percent less fuel on," he said. So it is small surprise that the Kirov tractors are currently returning to the fields of Canada, Australia, Poland, France and the former Soviet republic of Kazakhstan. "Additionally, we deliver our tractors to the Czech Republic and Slovakia," Serebryakov said, adding "the plans for next year include the expansion of a service network in all regions where we're present, the work on improving the tractor's performance characteristics and developing new models."